Caffeinated teas act as a diuretic, making you expel water through urine; however, they also contain hydrating water. 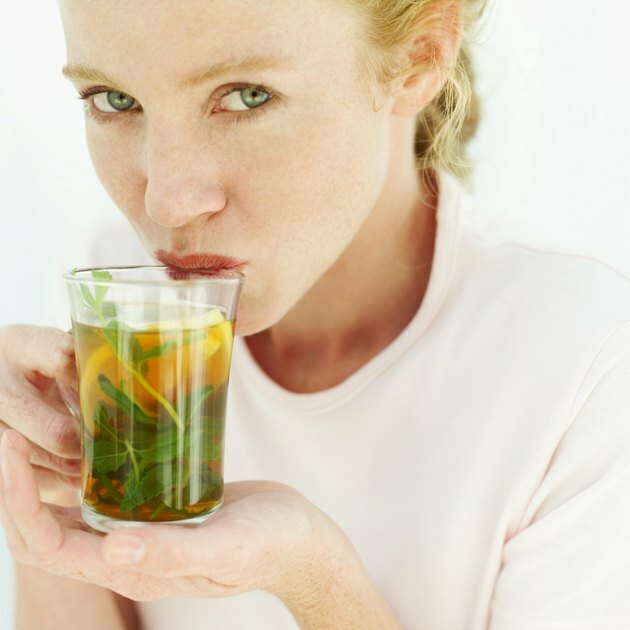 Herbal teas typically have no caffeine. Although the Food and Drug Administration recommends drinking extra water if you consume caffeine during exercise or hot weather, research shows that tea can be just as hydrating as plain water in moderate doses. Tea, coffee, juice, milk and other nonalcoholic beverages count toward your daily water intake, notes an article in "Scientific American." In a study published in "The British Journal of Nutrition" in 2011, men were given either 4 cups of black tea, 6 cups of black tea or the equivalent amounts of hot water over the course of a day on four separate days. Researchers found there was no significant difference in hydration levels after drinking tea versus water. Still, caffeine can have negative side effects such as digestive problems and anxiety when consumed in high doses. Medline Plus defines 5 cups of tea per day as a moderate consumption of caffeine and 10 cups per day as excessive.